Identify the students who are struggling in the Grade and Section you teach. How will you identify them? The obvious method is to zero in on those who are failing in the subject. Do each one of you have to take care of every such student? Not really. If the class teacher and the subject teachers have an understanding, we can beautifully share the responsibility of such students – with the result that each teacher needs to mentor may be 4-5 students or even less. If CAT4 scores are readily available, it is a great help. The Cognitive Abilities Test, also known as CAT4, is used to identify both a student’s academic potential and challenges. CAT4 is divided into four batteries – verbal, non-verbal, quantitative, and spatial ability. Look at their stanine scores. Anything below 5 is a matter of concern – the student could have one or more learning disabilities. A Standard Age Score (SAS) of anything below 100 too merits closer attention. If the scores – Stanine and SAS – are above the 5 and 100 respectively, but still the student is failing, there is every chance that the student has not been motivated to learn. It is up to us as teachers to identify these patterns that emerge and alert us via CAT4. If the Grade has not done CAT4 this year, no issues. Get the concerned student’s CAT4 results of the previous year as they are valid for 2 years. Give individual attention to such students. They will really thank you for that. Talk to them and understand what their difficulties are. In many cases you will find remarkable improvement, the moment you start paying attention to them. They will know their teacher cares for them and would go to any length to please you. Garner parental support. It would be a great idea to speak to the parents of such students to understand their home environment, study habits and the like. In many case when students gain the trust of their teacher, they will blurt out many home truths. Be a patient listener and never make assumptions or judgements. What we say in the classroom has a great impact on young minds. Encourage them and they will rise to your expectation. If not, they will not only hate you but also develop a hatred towards your subject. No student deserves to go through this. So use words with care. Make your students love you and a love for your subject and the irresistible desire to make you happy follows. That is the power a teacher wields. Never show your likes and dislikes in the classroom. One constant refrain that we hear when we speak to students is that there is “partiality”. Once that word goes amongst the student community teachers will have to really struggle to change that opinion. It’s only human that smart students will be favourites of teachers – but it is wise and sensible not to display it. Apply the same yardstick to all. Poor attitudes also lead to poor academic performance. Lack of motivation is seen in many students. If you are a class teacher, you can really make a difference. Subject teachers too can make the difference – but a class teacher gets some time with her students on most days. So her impact can be more than that of subject teacher. Besides as teachers we need to walk our talk. We must be motivated and full of vigour and enthusiasm. Our students will simply imitate us. Poor habits also result in poor learning. One key issue bogging many young students in today’s connected world is social media. WhatsApp, Facebook, Instagram, Snap Chat and Netflix rule their lives and they get addicted to FOMO – “Fear Of Missing Out”. Posting indecent pictures, befriending strangers and becoming victims to cyber bullying and online predators follow. As adults and teachers we have to be alert to this. Dipping grades can be a surest sign of this and similar distractions. Also note that such students live in a world far away from reality. Do note if a student is looking sleepy in class – it could be on account of spending time on social media without sleeping. Another barometer is their perceived self-esteem and self-confidence. Young girls, especially teens tend to compare themselves with others, feel low and depressed because they are not as tall, fair, beautiful or smart as someone else. Many a time, they don’t even know that the pictures of their idols or models are digitally enhanced to make them look tall, fair, beautiful and smart. No love for oneself and the resultant lack of self-esteem can lead to chronic depression, self-harm, and even suicide. We need to educate our girls to start loving themselves, as they are. Well, there’s a movement out there called F.L.Y. – First Love Yourself – for, if you can’t love yourself, how can you expect others to love you? Another important habit worth cultivating is impressing on students to get 7-8 hours of sleep. Research has shown that it is during sleep that our learning gets stacked in the brain for retrieval. Some students are simply anxious about tests. They will answer in class and will seem actively engaged but you may find nothing in the answer paper. Educate such students to understand the concept and study. Memorizing results in short term memory, whereas understanding and learning will contribute to long term memory and retrieval. Many students have no clue how to study. Talk to them about a specific place at home to study. Never study sitting in the bed. Underlining while studying is a classic sign of you trying to fool your brain by pretending to be engaged in study. Better is to make points, cover it with a sheet and then try to retrieve answers from understanding. Help them make a study plan. Tell them it is always better to study in small, manageable chunks. When a student finishes one chunk, there is a sense of achievement. That will egg them on to do some more. The bottom line is if we as teachers care about the relational aspect of teaching, we can establish a trusting and caring connection with our students. Then they will become more receptive to what’s being taught. When we get to know our students’ likes, dislikes, interests, talents, needs and home environs it helps us prepare differentiated lessons and helps students feel the partnership of the learning experience. Cheers!! Use of these in searching: site; file type [pdf; doc; txt]; symbols like –, +; and words like define, OR etc. Oh, boy, the best was yet to come! On 25th July I got this – a multi coloured one – my certificate of completion. Though the scores were not mentioned in the certificate, the course staff sent me the feedback: Mid-class assessment score: 100% Post-class assessment score: 74%. It was truly a happy moment. discuss possibilities of implementing the skills in our communities of practice. Though the programme did not give me any certificate of participation, it gave me a lot more by making me reflect into my own practice. I have mentored in the past and continue to do it even now. Therefore it impressed upon me that as a Mentor I am only a support / guide / listener. I must never don the roles of a saviour, parent, lawyer, banker, social worker or even employer. I can only listen and gently assist in encouraging the mentee to find solutions on his/her own. This was very insightful as in introspection I remember I have taken roles of a problem solver and an advisor while mentoring! This summer of 2013 saw me take up a MOOC – Massive Open Online Course. Online courses available on the world wide web are rapidly changing the face of education and learning. Many famous Universities have open up their portals for such online course which are free. Besides there are signature tracks available for those who are looking for credits for their higher studies. The MOOC that I participated in was Inspiring Leadership through Emotional Intelligence conducted by none other that Prof. Richard E Boyatzis http://en.wikipedia.org/wiki/Richard_Boyatzis from the Departments of Organizational Behaviour, Psychology, and Cognitive Science and H.R. Horvitz Chair of Family Business, Case Western Reserve University, Cleveland, Ohio, USA. The Coursera site on the instructor says, “Using his Intentional Change Theory (ICT) and complexity theory, he continues to research sustained, desired change at all levels of human endeavour from individuals, teams, organizations, communities, countries and global change.” https://www.coursera.org/instructor/richardboyatzis It is also worth remembering that he is an authority on the concepts of resonance in leadership and emotional contagion. This was a challenging course and as I write this I await the last week of July for the results of my course. Right now I am doing a Course in Psychology from www.udacity.com. That is not all. Now I am enrolled for at least half a dozen online courses offered by Coursera and Udacity, in the course of the year. It includes two courses offered by the University of Edinburgh on Critical Thinking in Global Challenges and E-learning and Digital Cultures respectively. I have thus become an an addict. An addict for a right cause – of taking in a share of the exponentially growing knowledge that is available around me. And the best thing is I can proceed at my pace. Why don’t you explore MOOCs? I am sure you will also turn to be a fan of these delightful affairs. Are we equipping our Students for Tomorrow’s Jobs? The other day, I was reading a very interesting hypothesis by the celebrated columnist and author, The World is Flat fame, Thomas L Friedman. His formula for knowledge acquisition in the 21st century is CQ+PQ>IQ. i.e. Curiosity Quotient + Passion Quotient will be greater than Intelligence Quotient. Thomas Friedman states that when curiosity is paired with passion in the exploration of a subject of interest, an individual may be able to acquire an amount of knowledge comparable that of a person who is exceptionally intelligent, because of the vast amount of information resources available through the Internet. He goes on a step further and declares, “Give me the kid with a passion to learn and a curiosity to discover and I will take him or her over the less passionate kid with a huge IQ every day of the week.” IQ “still matters, but CQ and PQ … matter even more.” For an educator this is sweet music. But are we equipping our students with these smart quotients in the classrooms is a million dollar question? “Standardized tests can’t measure initiative, creativity, imagination, conceptual thinking, curiosity, effort, irony, judgment, commitment, nuance, good will, ethical reflection, or a host of other valuable dispositions and attributes. What they can measure and count are isolated skills, specific facts and function, content knowledge, the least interesting and least significant aspects of learning.” says Bill Ayers in his book, To teach: the Journey of a Teacher, by William Ayers. To me the crux of the matter is simple. Let us make schools places of joy and fun. Let us make our students thinkers and creators. Decades from now, they will thank us for inculcating in them these skills. Let our children not say “I hate school”, like in this cartoon. Meanwhile, it is sad to see the ‘assembly line’ model working stronger than ever though we have moved away from the Industrial Age where conformity and standardisation were the norm. Without teaching creativity and being inspirational in the classroom how can we create in our students CQ – Curiosity Quotient and PQ – Passion Quotient? Without these it is not possible for them to take up jobs of the future! Mr. Conti, you have hit the nail on the head. You have done your best. So may you be able to live a superannuated life free of guilt! Today with tech tools, emails and instant messaging available, and key board proficiency gaining importance, no one seems to bother about cursive writing. Other than for examinations in schools and colleges, we hardly write with pen and paper in the real adult world. In fact the day that we will see pupils/students typing out their answers using tech devices in examination halls, is not far off. Be this as it may, I love cursive writing. I understand that many schools, public and private have altogether discarded the practice of teaching cursive writing. May be I am still old school. I believe that some training in penmanship is never out of place in schools – don’t we often say, “catch ‘em young” for everything? Then why not for this too? I did my primary school in a nuns’ convent – Sacred Heart Convent, Valparai, in the Anamalai Hills, Tamil Nadu. Therefore, handwriting was given utmost importance. Later, when I moved to St. Thomas Convent, Olavakkode, Palakkad, Kerala too, where I completed my middle school, things were not very different. While the first lessons were given at school, home was equally a place to reckon with. Dad and Mom who took keen interest in our education, paid as much interest in the cursive hand as the nuns did. At High School & College there was not very great stress on improving my handwriting – may be because by then it was well formed, and adorned with strokes in the running hand. 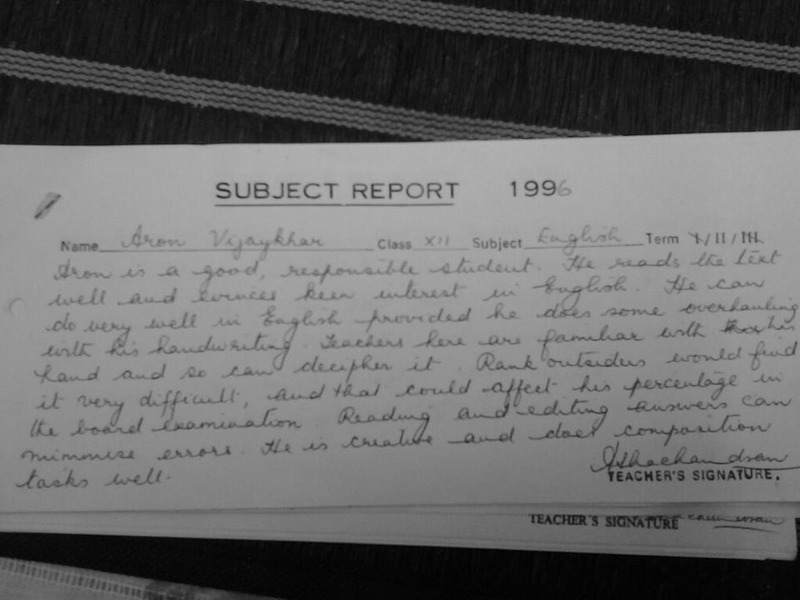 Yet, we had to write a page of copy writing from Social Studies or English lessons on a regular basis. At home, copy writing was the most important routine especially during holidays. We had to write a page copying the editorial of The Hindu newspaper in English and ditto from the Mathrubhumi for Malayalam. Once that was done, we could spend our entire day playing! And the fact that there was nothing indoors – no TV / Computer / Mobile phone etc – it ensured that we all played vigorously outdoors! Today when everyone tell me I have a beautiful handwriting, I thank the Nuns who encouraged this at school and say a truckload of thanks to Daddy. I wrote these newspaper editorial copies even while at college. Dad must have then thought that his dear daughter’s handwriting has become consistent and steady, and that she needn’t write in copy books anymore. But, I must have been about 20 years old when that happened. The result – a sinuous cursive writing hand, with strokes and swirls, making it the viewers’ delight, the owner’s pride! What charm is there in print letters? I see none. In fact, you need a cursive hand at least for your signature. Or else, won’t it be too easily forgeable? A lot of archived documents like constitution and so on are written in cursive in many countries. Won’t student have a disconnect with them if they can’t decipher cursive writing? Research and occupational therapy bodies ( The American Occupational Therapy Association – AOTA) vouch for the fact that learning cursive writing will hone the fine motor skills of students. *** “It’s the dexterity, the fluidity, the right amount of pressure to put with pen and pencil on paper,” Ms. Sandy Schefkind, a pediatric coordinator with AOTA says, adding that for some students cursive is easier to learn than printing. Studies also illustrate how writing by hand engages the brain in learning. Indiana University researchers using an MRI machine discovered that children’s neural activity was far more enhanced when they practiced writing by hand after receiving instruction than when they simply looked at letters. As a teacher I also feel that not being able to write in cursive could jeopardize the future of our pupils. I just cannot underestimate the enormous amount of self esteem and self confidence a beautiful cursive hand can instil in our pupils. For this very reason alone it is worth teaching our pupils the cursive hand. Check it out, for, I am a living example! I belong to the southern most state of Kerala. I am proud of the enchanting landscape of my state – the silver beaches, the lush fields and greenery, the swaying palms, the meandering backwaters – all of which gave it the much touted tag line, God’s Own Country. However, looking at the going on since the dawn of the new year, I am not sure if I should take pride in belonging to Kerala. Strikes and hartals have long since become the pastime of Kerala. Political parties declare strikes / hartals. Most people sit at home. The previous day there are serpentine queues before beverages corporation outlets. Armed with bottles, it is a fun time boozing. Besides, TV channels air movies. An unexpected holiday to watch them, booze again and have pure fun! The latest in the news is the Government Teachers’ (Schools & College) strike. Being a practicing educator, I can’t help looking at the choice of time for this strike. January and February are the most crucial times in the calendars of teachers in India. Annual examinations happen in March. In colleges, though most of the semester exams happen in April and May, the teaching time ends in March. How can teachers afford to lose out on valuable teaching time now? Lessons have to be completed, concepts have to be taught and students need to be given revision as well as practice tests. It is sad that those who have to mould future generations have thought least about this. They have also not thought of how lucky they are when compared with their peers in the unaided sector. Many of them get a paltry salary and hardly any perks. I even know of managements who terminate teachers on March 31st and appoint them again on 1st June, so as to save on money given to them as vacation salary. The most horrific aspect of these strikes is the kind of tactics the so called teachers and adults have indulged in. The media has reported incidents wherein velvet bean or cowitch powder was sprinkled on students in Trichur and Palakkad. Cowitch or Mucuna pruriens is a tropical legume. “The hairs lining the seed pods and the small spicules on the leaves contain 5-hydroxytryptamine (serotonin) which cause severe itching (pruritus) when touched. The calyx below the flowers is also a source of itchy spicules and the stinging hairs on the outside of the seed pods are used in itching powder. Water should not be used if contact occurs, as it only dilutes the chemical. Also, one should avoid scratching the exposed area since this causes the hands to transfer the chemical to all other areas touched. Once this happens, one tends to scratch vigorously and uncontrollably.” (Source: Wikipedia) It is this kind of a virulent powder which was sprinkled on young children. It is sad that those who have the power in them to mould minds have stooped to this low a level. What models are being portrayed by these acts? Isn’t there any conscience in these adults? It is time we woke up to the looming reality. If we put the young minds through these kinds of atrocities, they will grow up mindless and heartless. Then we will moan in our old age that our children are not taking care of us. Why should they when we have not taken care of them when we should have. Conscience – it has become a rarity! With examinations round the corner, here are strategies for pupils. Set a positive mood for yourself to study in. Mark any information you don’t understand in a particular unit. Keep a focus on one unit or a manageable group of exercises. After studying the unit, stop & put what you have learned into your own words. Go back to what you did not understand and reconsider the information. Contact external expert sources (e.g., other books / your teacher / your study buddy) if you still cannot understand it. In this step, ask three kinds of questions concerning the studied material. If I could speak to the author, what questions would I ask or what criticism would I offer? How could I apply this material to what I am interested in? How could I make this information interesting and understandable to other students? Go over the material you’ve covered. Skim the headings of the entire chapter. Your most important goal is to find out how the chapter is organized. If the major terms in the headings are unfamiliar – look them up. The same material could be organized more than one way. If the way it is organized helps you to remember the main topics, then use that organization. If you notice some other way it could have been organized that makes more sense to you, then use that method. Turn the subheadings under the major headings into questions that you expect to be answered in that part of the text. Try to see if the questions you anticipated are answered. Reflect on what you read; put it in your own words. Try to connect what you are reading to things you already know. Don’t mark or highlight words or passages as you come to them the first time. Wait until you have reached the end of a small section, maybe a paragraph or two and look back to decide if there is anything there that you probably wouldn’t remember without highlighting it. Try to learn through trial and error how much marking is the minimum you need to do to remember all the material. This is the most critical part. After reading a small section, perhaps a page or two CLOSE THE BOOK and try to write down the main ideas and as many details as you can, and then check yourself. Put main ideas & details in your own words; don’t just memorize exact words in the text. When you check, look for important things you omitted or got wrong. Do it again. Do it as many times as you need to until you can close the book and reproduce the material accurately, but meaningfully, not just by rote. Once you can do that immediately after closing the book, then start trying to do it after being away from the book for a while. First take short gaps, like an hour, then longer gaps, like a day or two. This is hard work. You might start by first trying to be able to make just a skeletal outline and build up the ability to fill in details. Develop your own mnemonics for memorizing points that you find confusing. After some time has passed, try to reproduce the material as you did above. The key here is that you must give yourself enough time to forget some of the material so that you are forced to really re-generate the material. Re-generate means that you use your mnemonics and connections from the easier-to-remember main ideas to pull up the details. Research has shown that reflection, spacing your study, and organizing all improve learning significantly. Before beginning reading look through the whole chapter. See what the headings are — the major ones and the subheadings; hierarchical structures seem to be particularly easy for our brains to latch onto — check for introductory and summary paragraphs, references, etc. Resist reading at this point, but see if you can identify 3 to 6 major ideas in the chapter. Ask yourself what this chapter is about: What is the question that this chapter is trying to answer? Or — along the curiosity lines — What question do I have that this chapter might help answer? Repeat this process with each subsection of the chapter, as well, turning each heading into a question. Read one section at a time looking for the answer to the question proposed by the heading! This is active reading and requires concentration so find yourself a place and time where you can concentrate. Say to yourself or write down a key phrase that sums up the major point of the section and answers the question. It is important to use your own words, not just copy a phrase from the book. Research shows that we remember our own (active) connections better than ones given to us (passive), indeed that our own hierarchies are generally better than others. After repeating steps 2-4 for each section you have a list of key phrases that provides a sort of outline for the chapter. Test yourself by covering up the key phrases and seeing if you can recall them. Do this right after you finish reading the chapter. If you can’t recall one of your major points, that’s a section you need to reread.